Wembley Stadium (often referred to simply as Wembley, or sometimes as the New Wembley) is a football stadium located in Wembley Park, in the Borough of Brent, London, England. It opened in 2007 and was built on the site of the previous 1923 Wembley Stadium. The earlier Wembley stadium, originally called the Empire Stadium, was often referred to as "The Twin Towers" and was one of the world's most famous football stadiums until its demolition in 2003. Designed by Foster and Partners and HOK Sport (since renamed Populous), it includes a partially retractable roof. A signature feature of the stadium, following on from the old Wembley's distinctive Twin Towers, is the 134 meter high (440 feet) Wembley Arch. With a span of 317 meters (1,040 feet), this steel arch is the longest single-span roof structure in the world and, uniquely for a stadium, requires beacons for low-flying aircraft. The stadium was built by Australian firm Multiplex at a cost of £798 million. The old Wembley closed in October 2000, with demolition originally intended for that December and the new stadium due to open in 2003. After delays to the project, with demolition first started in September 2002, the old Wembley was not completely demolished until February 2003, with the new stadium scheduled to open in time for the 2006 FA Cup Final. After further delays, the stadium was delivered nearly a year late, leading to legal disputes between WNSL and Multiplex, who ultimately made a significant loss on the project. The stadium was handed over on 9 March 2007, in time to host the 2007 FA Cup Final. In international football, the stadium was a central component of the failed English 2018 and 2022 FIFA World Cup bids. In 2012 it will host the football finals of the London Olympics. In club football, in addition to the FA Cup the stadium hosts the showpiece season-opening game the FA Community Shield match, played in August between the winners of the FA Cup and the top-level Premier League. In mid-season it also hosts the finals of the Football League Cup and Football League Trophy. At the end of the domestic season, the stadium also hosts the finals of the Football League play-offs. In European football, it hosted the 2011 Champions League Final, and will host the final again in 2013. In friendly tournaments, since 2009 it has been the venue of the summer Wembley Cup. Outside of football, the stadium also hosts major rugby league games, such as the Challenge Cup and International Rugby League. The stadium is also an annual regular season venue for the US National Football League's International Series, the first such venue outside North America. Non-sporting uses include large music concerts such as Concert for Diana, Live Earth and the Summertime Ball. Wembley was designed by architects Foster + Partners and Populous (known as HOK Sport at the time of the design phase and construction) and with engineers Mott MacDonald, built by Australian company Brookfield Multiplex and funded by Sport England, WNSL (Wembley National Stadium Limited), the Football Association, the Department for Culture Media and Sport and the London Development Agency. It is one of the most expensive stadiums ever built at a cost of £798 million (After MetLife Stadium) and has the largest roof-covered seating capacity in the world. Nathaniel Lichfield and Partners was appointed to assist Wembley National Stadium Limited in preparing the scheme for a new stadium and to obtain planning and listed building permission for the development. The all-seater stadium is based around a bowl design with a capacity of 90,000, protected from the elements by a sliding roof that does not completely enclose it. It can also be adapted as an athletic stadium by erecting a temporary platform over the lowest tier of seating. The stadium's signature feature is a circular section lattice arch of 7 m (23 ft) internal diameter with a 315 m (1,033 ft) span, erected some 22° off true, and rising to 133 m (436 ft). It supports all the weight of the north roof and 60% of the weight of the retractable roof on the southern side. The archway is the world's longest unsupported roof structure. Instead of the 39 steps climbed, in the original stadium, to enter the Royal Box and collect a trophy, there are now 107. A "platform system" has been designed to convert the stadium for athletics use, but its use would decrease the stadium's capacity to approximately 60,000. No athletics events (track and field) have taken place at the stadium, and none are scheduled. The conversion for athletics use was a condition of part of the lottery funding the stadium received, but to convert it would take weeks of work and cost millions of pounds. The initial plan for the reconstruction of Wembley was for demolition to begin before Christmas 2000, and for the new stadium to be completed some time during 2003, but this work was delayed by a succession of financial and legal difficulties. In 2004, the London Mayor and Brent Council also announced wider plans for the regeneration of Wembley, taking in the arena and the surrounding areas as well as the stadium, to be implemented over two or three decades. Delays to the construction project started as far back as 2003. In December 2003, the constructors of the arch, subcontractors Cleveland Bridge, warned Multiplex about rising costs and a delay on the steel job of almost a year due to Multiplex design changes which Multiplex rejected. Cleveland Bridge withdrew from the project and replaced by Dutch firm Hollandia with all the attendant problems of starting over. 2004 also saw errors, most notably a fatal accident involving carpenter Patrick O'Sullivan for which construction firm PC Harrington Contractors were fined £150,000 in relation to breaches of health and safety laws. In October 2005, Sports Minister Richard Caborn announced: "They say the Cup Final will be there, barring six feet of snow or something like that". By November 2005, WNSL were still hopeful of a handover date of 31 March, in time for the cup final on 13 May. However in December 2005, the builders admitted that there was a "material risk" that the stadium might not be ready in time for the final. In February 2006 these worries were confirmed, with the FA moving the game to Cardiff's Millennium Stadium. On 20 March 2006, a steel rafter in the roof of the new development fell by a foot and a half, forcing 3,000 workers to evacuate the stadium and raising further doubts over the completion date which was already behind schedule. On 23 March 2006, sewers beneath the stadium buckled due to ground movement. GMB Union leader Steve Kelly said that the problem had been caused by the pipes not being properly laid, and that the repair would take months. Rumours circulated that the reason for the blockage was due to Multiplex failing to pay the contractors who laid the pipes who then filled in the pipes with concrete. A spokesman for developers Multiplex said that they did not believe this would "have any impact on the completion of the stadium", which was then scheduled to be completed on 31 March 2006. On 30 March 2006, the developers announced that Wembley Stadium would not be ready until 2007. All competitions and concerts planned were to be moved to suitable locations. On 19 June 2006 it was announced that the turf had been laid. On 19 October 2006 it was announced that the venue was now set to open in early 2007 after the dispute between The Football Association and Multiplex had finally been settled. WNSL was expected to pay around £36m to Multiplex, on top of the amount of the original fixed-price contract. The total cost of the project (including local transport infrastructure redevelopment and the cost of financing) was estimated to be £1 billion (roughly US$1.97 billion). The new stadium was completed and handed over to the FA on 9 March 2007. The official Wembley Stadium website had announced that the stadium would be open for public viewing for local residents of Brent on 3 March 2007, however this was delayed by two weeks and instead happened on 17 March. While the stadium had hosted football matches since the handover in March, the stadium was officially opened on Saturday 19 May, with the staging of the 2007 FA Cup Final. Eight days before that on Friday 11 May, the Bobby Moore Sculpture had been unveiled by Sir Bobby Charlton outside the stadium entrance, as the "finishing touch" to the completion of the stadium. The twice life-size bronze statue, sculpted by Philip Jackson, depicts England's 1966 World Cup winning captain Bobby Moore, looking down Olympic Way. The stadium contains 2,618 toilets, more than any other venue in the world. The bowl volume is listed at 1,139,100 m3, somewhat smaller than the Millennium Stadium in Cardiff, but with a greater seating capacity. There are 56 km|mi|abbr=on}} of heavy-duty power cables in the stadium. 90,000 m3 (120,000 yd3) of concrete and 23,000 tonnes (25,000 short tons) of steel were used in the construction of the new stadium. The total length of the escalators is 400 m (¼ mi). The Wembley Arch has a cross-sectional diameter greater than that of a cross-channel Eurostar train. The new pitch is 13 feet (4 meters) lower than the previous pitch. The pitch size, as lined for association football, is convert 115 yd (105 m) long by 75 yd (69 m) wide, slightly narrower than the old Wembley, as required by the UEFA stadium categories for a category four stadium, the top category. Since the completion of the new Wembley, the pitch has come into disrepute since it was described as being "no good" and "not in the condition that Wembley used to be known for" by Slaven Bilić before the game between England and the team he managed, Croatia. It was confirmed when the pitch was terribly cut up during the game, which was blamed by some as the reason England did not qualify for UEFA Euro 2008. The Football Association admitted in April 2009 after the FA Cup semi-finals that improvements are needed to the Wembley pitch after criticism of the surface by Sir Alex Ferguson, Arsène Wenger and David Moyes. The grass has been relaid ten times since the stadium re-opened in 2007 and was relaid again in the summer of 2009, ahead of the 2009 Community Shield. In March 2010, the surface was relaid for the 10th time since 2007, when the stadium was built. In April 2010, the pitch was again criticised following the FA Cup semi-finals, during which the players found it difficult to keep their footing and the surface cut up despite the dry conditions. Tottenham Hotspur boss Harry Redknapp labelled it a "disgrace" after his side's semi-final defeat to Portsmouth. After the 2010 FA Cup Final, Chelsea captain John Terry said, "The pitch ruined the final. It’s probably the worst pitch we’ve played on all year. It was not good enough for a Wembley pitch." It was relaid with Desso semi-artificial pitch, ahead of the 2010 community shield game between Chelsea and Manchester United. Michael Owen, who previously criticized the pitch for causing him injury, said that it was much improved. The stadium roof has an area of 40,000 square meters, of which 13,722 m sqaure meters is movable. The primary reason for the sliding roof was to avoid shading the pitch, as grass demands direct sunlight to grow effectively. The sliding roof design minimises the shadow by having the roof pulled back on the east, west and south. Angus Campbell, chief architect, also said that an aim was for the pitch to be in sunlight during the match between the beginning of May and the end of June, between 3 pm and 5 pm, which is when the FA and World cups would be played. However it was mentioned during live commentary of the FA Cup Final in 2007 that the pitch was in partial shade at the start at 3 pm and also during the match. The stadium roof rises to 52 metres above the pitch and is supported by an arch rising 133 metres above the level of the external concourse. With a span of 315 metres, the arch is the longest single span roof structure in the world. The Australian firm Multiplex, which was the main contractor on Wembley Stadium, made significant losses on the project. In an attempt to recoup some of those losses, the firm has initiated a number of legal cases against its sub-contractors and consultants. The largest of these – the largest legal claim in UK legal history – is a claim for £253 million against the structural engineering consultants Mott Macdonald. In preliminary hearings the two architecture practices which worked for Multiplex on the project have been ordered to allow Multiplex access to their records in order for them to build a case. The practices, Foster + Partners and Populous, estimate the costs of providing access and answering Multiplex's queries at £5 million. The case is not due to be heard until January 2011. Mott Macdonald has issued a counter-claim for unpaid fees of £250,000. The dispute between Multiplex (now known as Brookfield) and Mott Macdonald was settled out of court in June 2010, the judge having warned that costs were likely to be more than £74 million. Multiplex has also taken the original steel contractor, Cleveland Bridge, to court in order to claim up to £38 million compensation for costs resulting from Cleveland Bridge walking away from the job. Cleveland Bridge, in turn, claimed up to £15 million from Multiplex. The case was finally resolved in September 2008 with Cleveland Bridge ordered to pay £6.1 million in damages and 20% of Multiplex's costs after the court found Cleveland Bridge was in the wrong to walk off site. The judge criticised both sides for allowing the case to reach court, pointing out that total costs were £22 million, including £1 million for photocopying. Multiplex's ultimate bill is estimated to be over £10 million. Multiplex is also contesting a claim from its concrete contractor, PC Harrington, that Multiplex owes £13.4 million to PC Harrington. The English national football team is a major user of Wembley Stadium. Given the ownership by The Football Association as of 10 March 2007, the League Cup final moved back to Wembley from Cardiff following the FA Cup final and FA Community Shield. Other showpiece football matches that were previously staged at Wembley, such as the Football League promotion play-offs and the Football League Trophy final, have returned to the stadium, as has the Football Conference play-off final. Additionally, the Rugby League Challenge Cup final returned to Wembley Stadium in 2007. The new Wembley is a significant part of the plan for the 2012 Summer Olympics in London; the stadium will be the site of several games in both the men's and women's football tournaments, with the finals planned to be held there. Additionally, Wembley is one of the 12 2015 Rugby World Cup venues, for which pitch changes will have to be made. The Race of Champions staged their 2007 and 2008 events at the stadium. 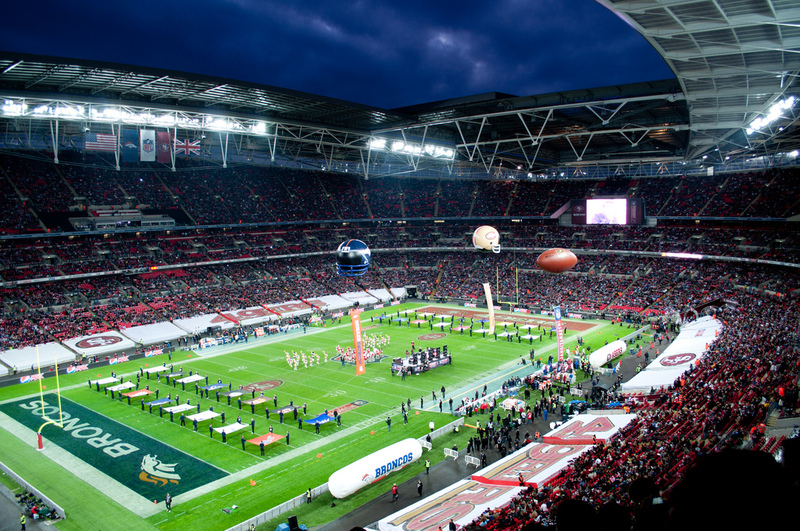 Wembley has had a long association with American Football. A USFL game was staged there in 1984, and between 1986 and 1993 the old Wembley stadium hosted eight NFL exhibition games featuring 13 different NFL teams. Since the new Wembley Stadium opened in 2007 Wembley has hosted games during the NFL regular season. As a result of this, NFL commissioner Roger Goodell stated in October 2009 that "he expects the NFL will start playing multiple regular-season games in Britain in the next few years, an expansion that could lead to putting a franchise in London." In 2012, the league announced that the St. Louis Rams would become a permanent tenant of Wembley Stadium, playing an annual game at the stadium every year from 2012 to 2014; part of the reason the Rams were chosen was the fact that the team is owned by Stan Kroenke, who also is majority shareholder in a local Premier League team, Arsenal. On 28 October 2007, the New York Giants defeated the Miami Dolphins by a score of 13–10 in the first NFL regular-season game to be played outside of North America, and first ever to be played in Europe in front of 81,176 fans. The first touchdown scored at Wembley was on a run by quarterback Eli Manning of the New York Giants. In 2011 the Chicago Bears beat the Tampa Bay Buccaneers 24- 18. The stadium is linked to Wembley Park Station on the London Underground via Olympic Way, and Wembley Central via the White Horse Bridge. It also has a rail link provided by the Wembley Stadium railway station to London Marylebone and Birmingham. A short documentary of the stadium's redevelopment can be found on the Queen Live at Wembley '86 DVD. Although not completed or opened at the time, EA Sports added Wembley Stadium into the video game FIFA 07. ↑ "Gates' Microsoft Becomes Wembley Stadium Backer", Forbes, 20 October 2005. ↑ "Wembley kick-off: Stadium is ready and England play first game in fortnight", Daily Mail, 9 March 2007. Retrieved on 19 March 2007. ↑ Belson, Ken. "New Stadium, a Football Palace, Opens Saturday With Lacrosse", The New York Times, 8 April 2010. Retrieved on 25 April 2010. ↑ Projects : National stadium, Wembley. Nathaniel Lichfield and Partners. ↑ Wembley Stadium Uses. Wembley National Stadium Limited. ↑ "Wembley arch due for completion", BBC News, 16 February 2004. ↑ A beautiful new home for the beautiful game. Soccernet.espn.go.com (31 May 2006). Retrieved on 11 August 2010. ↑ By FA Editorial - Tuesday, 20 April 2004 (20 April 2004). New Wembley taking shape. TheFA.com. Retrieved on 14 March 2012. ↑ "Firm fined over Wembley stadium death", The Independent, 9 July 2009. ↑ "Wembley chief's Cup final doubts", BBC News, 11 November 2005. Retrieved on 11 August 2010. ↑ "FA plays down doubts over Wembley", BBC News, 21 December 2005. Retrieved on 11 August 2010. ↑ "Wembley cleared after beam slips", BBC News, 20 March 2006. Retrieved on 11 August 2010. ↑ "Wembley dismisses 'sewer problem'", BBC News, 23 March 2006. Retrieved on 11 August 2010. ↑ "Stadium delay hits Wembley gigs", BBC News, 31 March 2006. Retrieved on 11 August 2010. ↑ Footballing legend Bobby Moore returns to Wembley. www.wembleystadium.com > Press Releases. Wembley National Stadium (10 May 2007). Archived from the original on 3 May 2010. Retrieved on 3 May 2010. ↑ Footballing legend Bobby Moore takes his place at Wembley. www.wembleystadium.com > Press Releases. Wembley National Stadium (11 May 2007). Archived from the original on 3 May 2010. Retrieved on 3 May 2010. ↑ "Doors finally open at new Wembley", BBC News, 17 March 2007. Retrieved on 19 March 2007. ↑ 21.0 21.1 21.2 21.3 21.4 21.5 21.6 Presspack : Facts and Figures. Wembley National Stadium Limited. ↑ 22.0 22.1 Building Wembley : Construction facts. Wembley National Stadium Limited. ↑ "'Steel the key' to extra time", BBC News, 21 February 2006. Retrieved on 19 March 2007. ↑ Wembley Stadium Arch Facts and Figures. wembleystadium.com. Retrieved on 19 March 2007. ↑ "Bilic blasts poor Wembley pitch", BBC Sport, 21 November 2007. Retrieved on 21 January 2008. ↑ Winter, Henry. "Croatia end woeful England's Euro 2008 dream", The Daily Telegraph, 22 November 2007. Retrieved on 22 January 2008. ↑ Siret, Mal. "English game is paralysed by a fear of the unknown", The Times. Retrieved on 22 January 2008. ↑ "FA to address Wembley pitch issue", BBC Sport, 20 April 2008. Retrieved on 20 April 2009. ↑ "FA promises action now and later over Wembley's problem pitch", The Guardian, 20 April 2009. Retrieved on 20 April 2009. ↑ "Harry Redknapp seethes at 'disgraceful' Wembley pitch", BBC Sport, BBC, 11 April 2010. Retrieved on 13 April 2010. ↑ Siret, Mal. "John Terry: Wembley pitch ruined the final", The Times, 15 May 2010. Retrieved on 16 May 2010. ↑ "Owen happy with Wembley", Sky Sports, Sky Sports, 9 August 2010. Retrieved on 9 August 2010. ↑ Presspack: Key features. Wembley National Stadium Limited. ↑ Denis Campbell,. "Eight-year Wembley stadium saga is over at last", The Guardian, 15 October 2006. ↑ "Losses for Wembley firm hit £106m", BBC News, BBC, 23 February 2006. ↑ 40.0 40.1 Hoyle, Rhiannon. "Mott MacDonald steels itself for high court battle over Wembley Stadium", The Guardian, 9 July 2009. ↑ Will Henley (20 March 2009). Wembley architects fear ‘ruinous cost’ of ruling. bdonline.co.uk. ↑ Joey Gardiner (25 June 2010). Final whistle for £253m Wembley row. Building. ↑ Andrew Mylius (22 June 2006). Wembley judgement 'lets contractors screw subbies'. nce.co.uk. ↑ Owen McAteer. "Both sides claim victory as judge rules on Wembley row", The Northern Echo, 30 September 2008. ↑ Chloë McCulloch (5 December 2007). Multiplex wins another legal spat over Wembley stadium. Building. ↑ London2012.com profile. - accessed 29 September 2010. ↑ NFL in the UK (25 October 2009, publisher=nfllondon.net). ↑ Goodell expects more games to be played in Britain soon",. nfl.com (2009). ↑ "Giants beat Miami at wet Wembley", BBC Sport, 28 October 2007. Retrieved on 12 January 2012. ↑ Walking directions to Wembley Stadium from Wembley Park tube station. Google Maps. ↑ Access & Car Parks (PDF). Wembley Stadium. Retrieved on 23 March 2012.